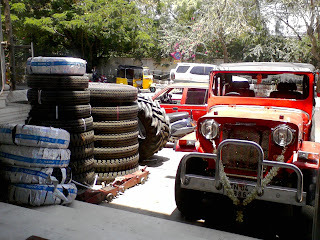 The first run in chennai for my mahindra classic is to the tyre shop as I have to do that in high priority to save the wheels and suspensions of the jeep. 215/75 R15 the tyre size of Mahindra Classic was been the last work to complete on the Classic, along side the windshield also changed yesterday. 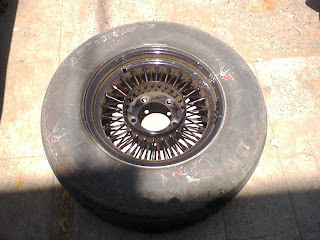 The below picture shows the old tyre with black colored wire wheels. I need to avoid the chrome plating work as the guys in garage advised me not to do, because the alignment of spokes may get spoiled if i do that. So simply colored it with black. While I was looking out for options, I made my mind with Haida (Made in China) tyres which had a good button type for both off and on road. 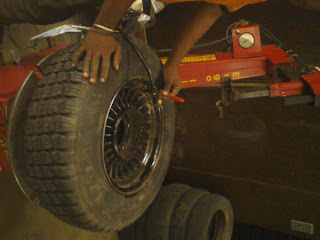 This tyre is also worked out economically compare to its Indian/US counter parts. 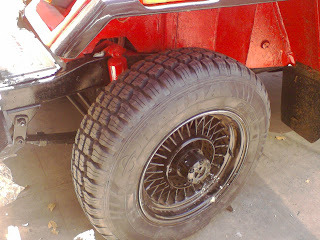 Now the jeep looks appealing with the new tyre, here is the picture of fitted tyre. All the 4 wheels wear a new shoe now. So, the Classic has reached Velcachery!! Congrats!!! Hope to see on your road very soon. Hey Ranjit, Yup it is here now. Many spotted me here in OMR already.